I’ve recently become addicted to smoothie bowls because they’re so easy…and well….Instagram worthy. Haha. 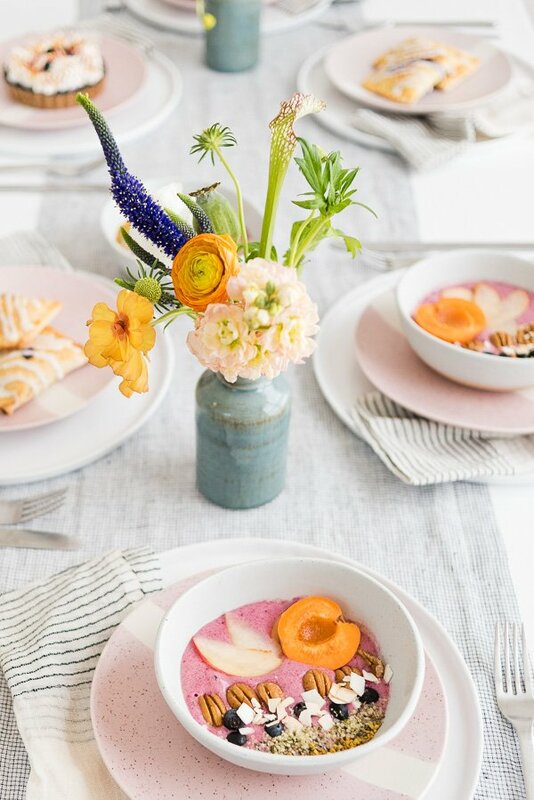 And this recipe is both of those things – literally the easiest breakfast idea (only two ingredients for the base) and so pretty! 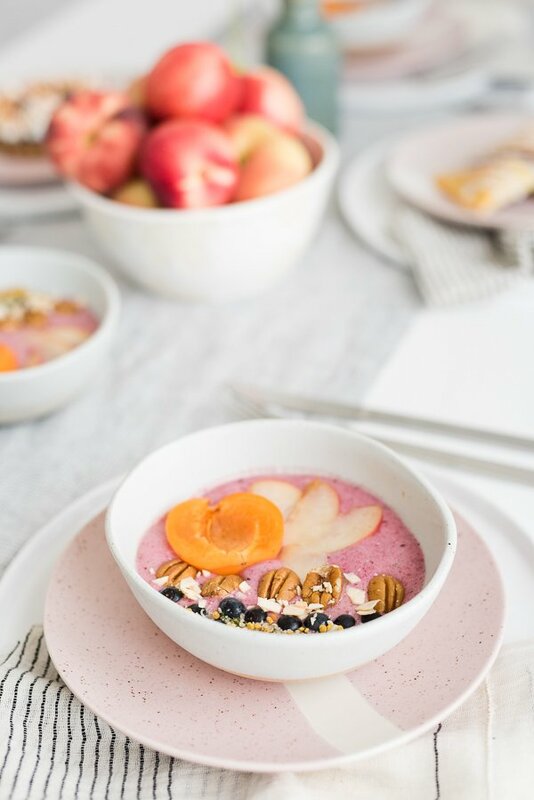 I asked my friend Alejandra from Hell Yeah Gluten Free to share her smoothie bowl secrets with you. She makes the prettiest / most delicious smoothie bowls I’ve had. And today I’m sharing her recipe base, along with TONS of additional flavor combos. Makes two servings. 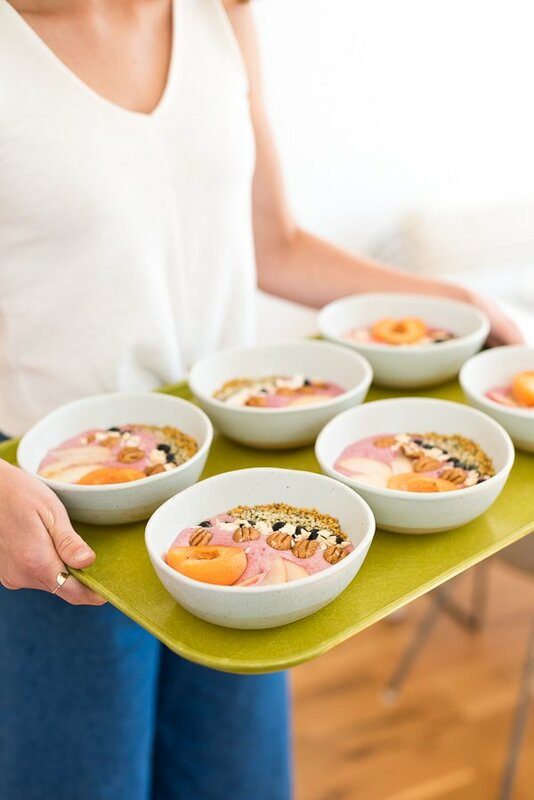 The base for these smoothie bowls is similar to ‘nice cream’. 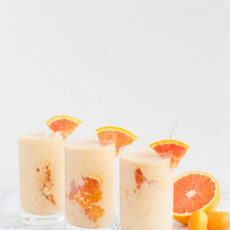 Its somewhere between a smoothie and the creaminess of soft serve ice cream, but with only natural sugars and packed with fiber and potassium. One of the best parts of this smoothie bowl base though is it’s versatility. You can make almost any flavor you want, with just a couple of common pantry / fridge staples. You’ll also need a food processor (a high-powered blender may work too, but my Vitamix wasn’t happy trying to churn through frozen bananas). Start with frozen bananas as a base. If you have a lot of freezer space, it’s best to go to the store when bananas are on sale and buy several bunches. Then, break them up into gallon zip-closure bags and freeze them. This works best when they’ve been frozen at least overnight. When the mixture is done, it should be as creamy and perfect as the most amazing soft serve or frozen custard you’ve had. You can test it by dragging the bottom of a spoon around in the mixture. Does it look and feel lovely? Then its ready! Pick a Mix-in… peanut butter, cocoa powder, fresh chopped fruit, dragonfruit or butterfly pea powder, instant espresso powder – Bustelo is a personal favorite! 1. Pink + exotic (pictured) Add dragonfruit and cranberry or pomegranate juice! 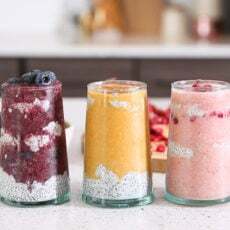 Dragonfruit is available at local health food stores (check the frozen section for cubed dragonfruit or dragonfruit smoothiepouches) or conveniently in powdered form through Amazon! Pictured here, we add seasonal stonefruit: half an apricot and some slices of nectarine, fresh blueberries, toasted coconut flakes, hemp seed powder for protein, and local bee pollen which is great for allergies. 2. Go nuts! Add 2 tbsp of peanut or almond butter (or 2 tbsp powdered peanut butter in a pinch!) and use almond milk as your liquid. Top with more nut butter, assorted nuts, and dried fruit for some texture. 3. Feeling a little under the weather? Add 1/2 tsp of turmeric, 1 tsp ginger powder (or 1 tbsp ginger puree–you can find it in a tube at some grocery chains! ), and a tbsp honey for an antioxidant-packed, antibacterial treat! Great if you have a sore throat or need a little boost! 4. Need a boost? Add 2 tbsp cocoa powder, one packet of instant espresso, and a splash of milk. Top with cacao nibs or chocolate-covered espresso beans for extra credit. 5. Need some greens? Add half an avocado, frozen spinach, 1tbsp pureed ginger, and 1/8 cup coconut milk. Top with cashews, cacao nibs, goji berries, hemp seed hearts, or whatever your heart desires! 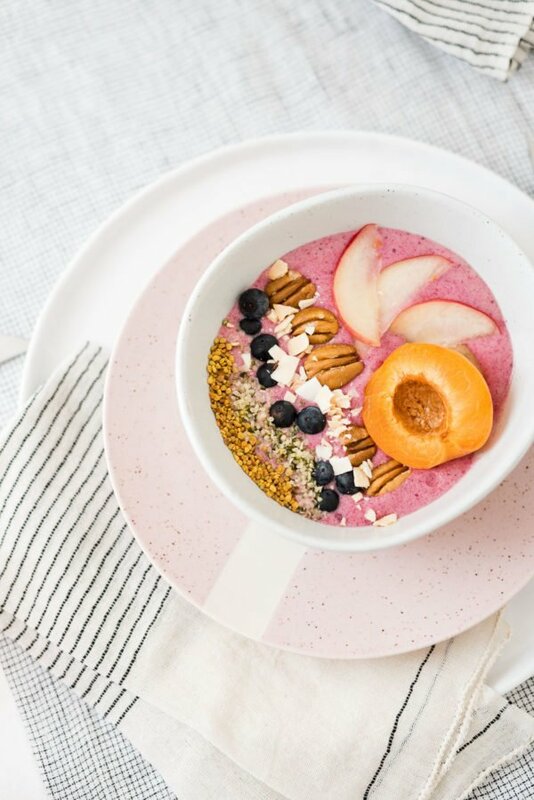 Are you a smoothie bowl fan? 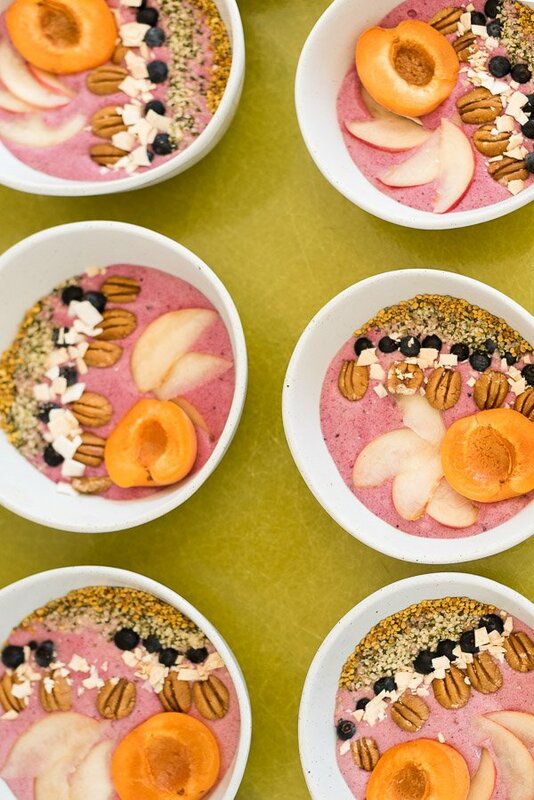 What kinds of smoothie bowls are your go-tos? Yummy, they look absolutely pretty! I bet they taste amazing as well, I really have to try them sometime! I live for smoothie bowls! They’re my favorite in the mornings! I’ve been so low in energy lately. I think that a nutritious smoothie bowl is just what I need! They look beautiful! Thanks for sharing your recipe! I’m going to make a couple bowls tom! I don’t like smoothies because of the texture. 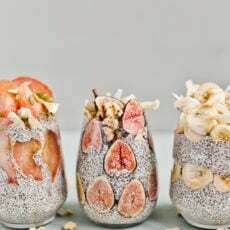 For me, a drink is not something that you have to chew, so I guess it might work better as a smoothie bowl with plenty of delicious toppings. I’m so sick of my classic toasts and cheese in the morning, with spring coming, it might just be the right time for me to try them out. They look sooo pretty and delicious, almost too good to eat! 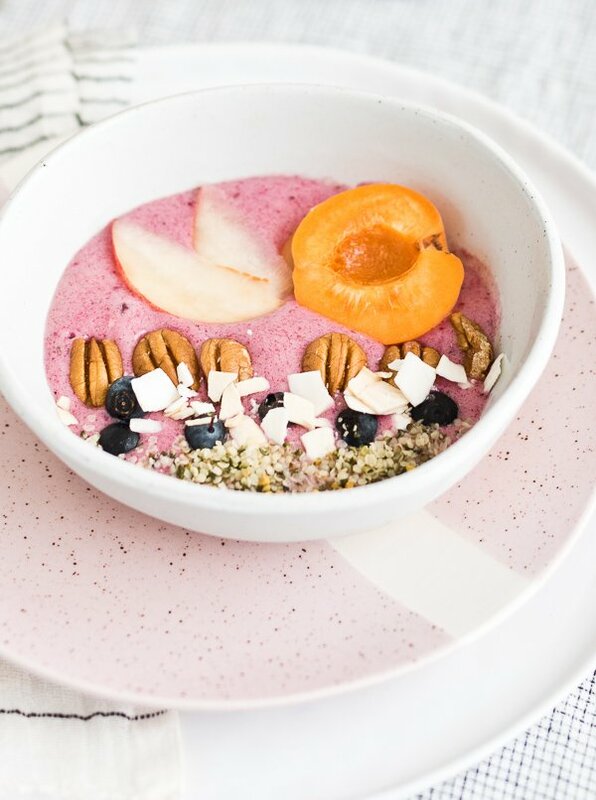 Ohh a smoothie bowl is a great idea. Sometimes when I make smoothies I don’t put enough liquid in it, so it is too thick to drink easily. Tossing it a bowl with some fruit and granola sounds yummy!